For our blog post, One Eleven Boutique in downtown Missoula let us raid the store! Brian Johnson from Missoula Photography School! Students at the University of Montana are on a countdown to the end of the semester! But before we enjoy endless Christmas cookies and hours of sleep, we have to face finals week. Just the thought of finals gives me anxiety. I already can see myself throwing my hair into a huge knot with my coffee pot overflowing. Frazzled with exams, my wardrobe will take a backseat and the XL sweatpants ,which once seemed only appropriate for the gym, soon become a much needed staple. My study partner will insist I dress for success. This is not the first time I’ve heard “dressing up” helps improve focus and self confidence. When running on 5 hours of sleep, improving my focus could help me out. So, this finals week I will try it. But, I have a few restrictions. If I “dress up” I will be comfortable! My token leopard skinny skinny jeans will not make the cut, and neither will anything I can’t cross my legs in. 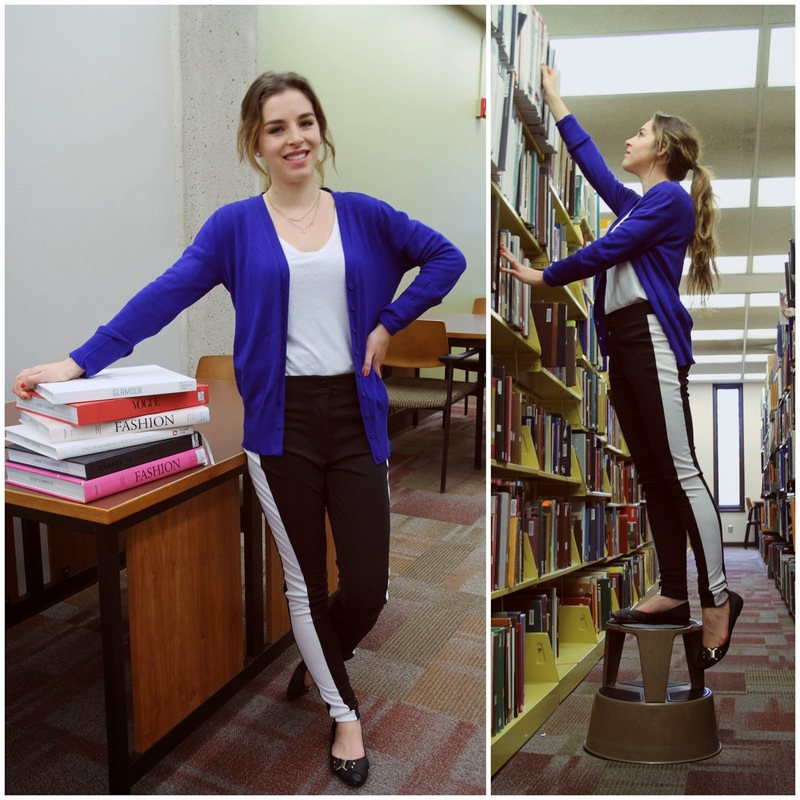 A team of ladies and I from Trendsetters at the U put together four effortless, comfortable, and fashionable finals week outfits to help you ace finals week. The patterned leggings that I wore are comfortable and warm but also add interest to the outfit. Wearing a denim shirt opened over a plain top is a really easy way to layer up your look and make it look like you put in more effort than you actually did. And lastly, a scarf is a perfect way to finish any look off because not only does it look cute, but it is an accessory that will keep you nice and warm which is perfect for long days in the library and throughout the cooler months. This outfit is great for lounging because it’s cozy and easy to throw together quickly. Leather leggings look more put together than plain leggings and you don’t have to sacrifice comfort. Wearing a long chiffon undershirt is an easy trick to make your top appear longer, which is helpful when wearing leggings. Throwing on a beanie is a quick fix when you don’t have time to do your hair. My favorite thing about this outfit is is how warm and cozy it is. Chunky sweaters are the best winter staple! 1. “Mistletoe Sweater” in Emerald from American Eagle Outfitters. What I like most about this outfit is its simplicity. Just three pieces make up this entire look. 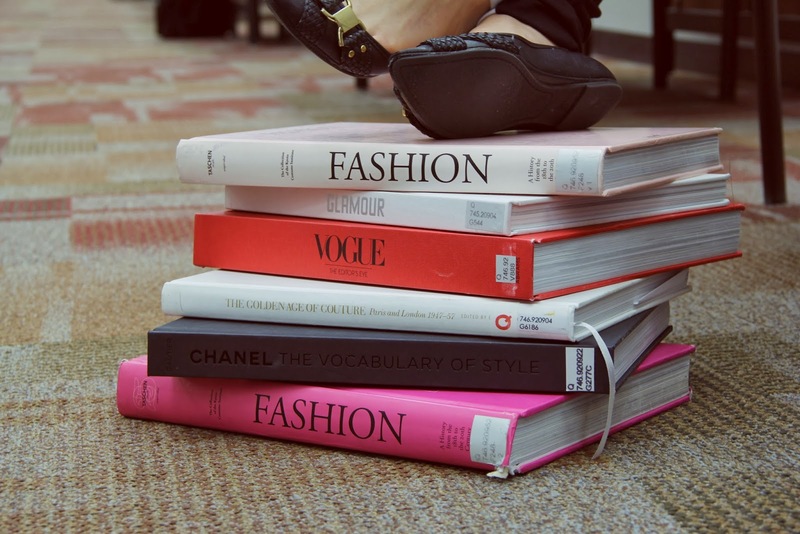 When most of my days leading up to finals week are spent closing down the library- I tend to reach for effortless, comfortable items which allow me to get ready in a fraction of the time. 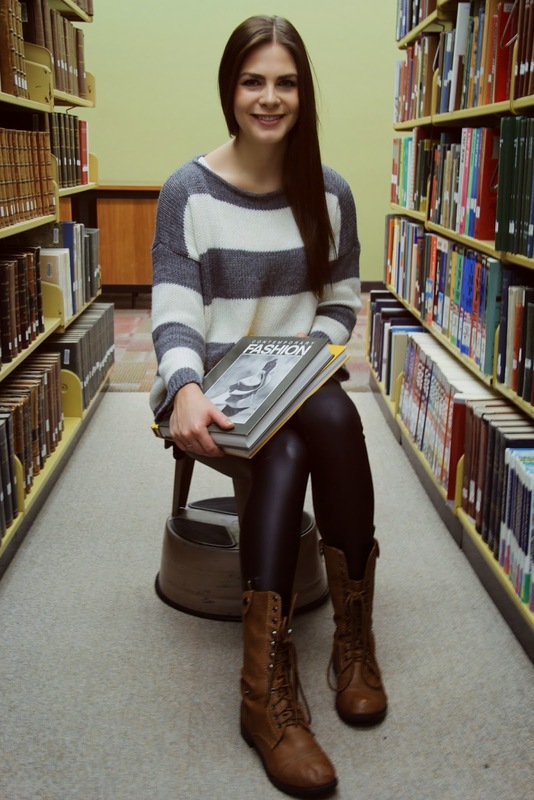 An over-sized sweater and leggings paired with boots accomplish this well. Emerald is a hugely popular color this season, and high-waisted, printed leggings add just the right amount of interest when balanced out with the solid colored top. Tuck them into some motorcycle boots, pull your hair to the side into a loose, two-minute fishtail braid, and you can be on your way to your finals in looking cozy and still fashion-forward. 4. Shoes – very old! I absolutely love these pants, they might be my new favorite pair! I recently purchased them from Rue 21 for $6! These pants have a two things I love: style and comfort. I love the high waisted style and stripe detail on the side. These pants are stretchy like leggings, but have a zipper and button like jeans, what more could I want?! Finally, the high waisted style looks more fashion forward than ordinary pants. The stripe down the side gives the illusion of thinner legs as well! I chose my favorite loose comfy white shirt and cobalt blue cardigan to add a pop of color. This outfit is great for finals week because you won’t have to compromise style for being comfortable.